I called a veteran personnel man I trust late Tuesday to ask about Darrelle Revis. The call was placed to this personnel guy because his team will be in the market for cornerbacks (plural) this offseason, and it seems more likely than not that the Jets will either release Revis or cut significantly his scheduled $15.3 million in 2017. The matter of Revis, of course, was complicated last week when he was charged with four felony crimes after an altercation outside a bar in Pittsburgh that left two men unconscious. The matter won’t begin to be adjudicated until March 15 in Pittsburgh, which creates a problem for teams interested in Revis should the Jets cut him. Free agency begins March 9. Even if Revis is on the street when the legal proceedings begin, no one’s likely to sign him with this hanging over his head. Revis will be 32 in July. This brief discussion of Revis will have nothing to do with guilt or innocence—only whether any team out there would be willing to overlook his slide as a player and decline in effort to believe he can be excited about playing football anymore. 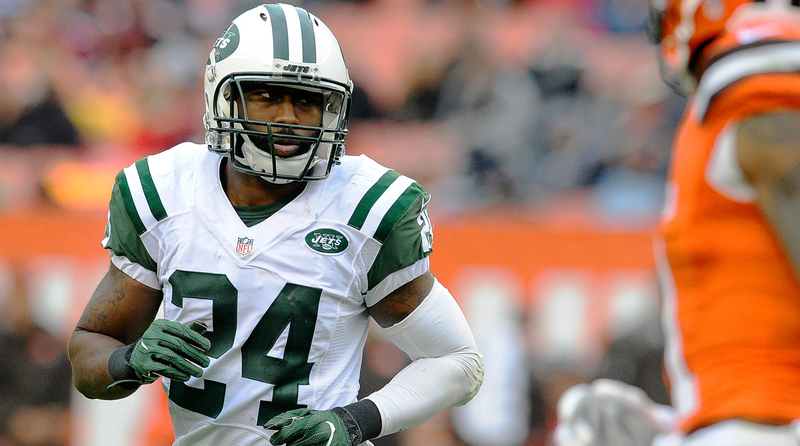 Darrelle Revis might face a position switch to safety to continue his football career. I asked the man his gut feeling of what Revis would be worth on the open market. Harsh. But it sounds real. The other factor this personnel man didn’t say: “My body’s breaking down,” Revis told Kimberley Martin of Newsday in October. And it got worse from there. In 2015, after the Jets signed him for a second term, he still showed shutdown ability. Pro Football Focus numbers in 2015 had Revis allowing just a 46.5-percent rate of completions to the receivers he was covering. In 2016, that number ballooned to 66.7 percent. PFF rated Revis the 64th cornerback in football last year. Two years earlier, he was third in the PFF rankings. It’s also unclear whether he could make the move to safety. Rod Woodson and Charles Woodson did it late in their careers, and in particular Charles Woodson had a terrific second act as a player when he moved to more of a center-fielder position. “The question is: Will he be motivated to learn some new skills and make the move?” the personnel man said. It could be that an offseason of work and shoulder rehab will have Revis feeling great and feeling like he wants to take one more shot at being a great player. He may fit better right now in a predominantly zone scheme at corner, because teams could be leery of having him play a lot of man corner after the nightmarish 2016 season with the Jets. On the other hand, Revis might chafe at being seen as a zone corner now, and he might want to prove that 2016 was a fluke. Also, it’s conceivable he would feel reborn at safety, if some team would give him the free-safety spot where he could use some physicality but much more instinct to influence a game. I wouldn’t be surprised if the perennially cornerback-needy Steelers could be interested if the price is right, or Green Bay (31st against the pass last year) or New Orleans (32nd). Revis will have some suitors, to be sure, if the Jets cut him loose … if he skates on the charges in Pittsburgh, and if he still wants to devote time to be great again. Two big ifs as we sit here two weeks prior to the opening day of free agency. Cody Kessler was winless in eight starts for the Browns, but flashed promise with a respectable rating (92.3) and a +4 TD-INT differential. I am endlessly frustrated with the thinking that the Browns should trade first-round picks for any quarterback. Cody Kessler's ceiling is Alex Smith, which for a run-first coach is acceptable if Kessler can avoid turnovers. The Browns have enough holes to fill on both sides of the ball before they trade meaningful assets for a quarterback with an extremely limited data sample. It's frustrating when folks caution about Mike Glennon's future after the Osweiler deal, but shouldn't the same be said for Garoppolo? He has a handful of NFL throws under his belt. There is little guarantee that Garoppolo could succeed in Cleveland, especially if the defense needs help. 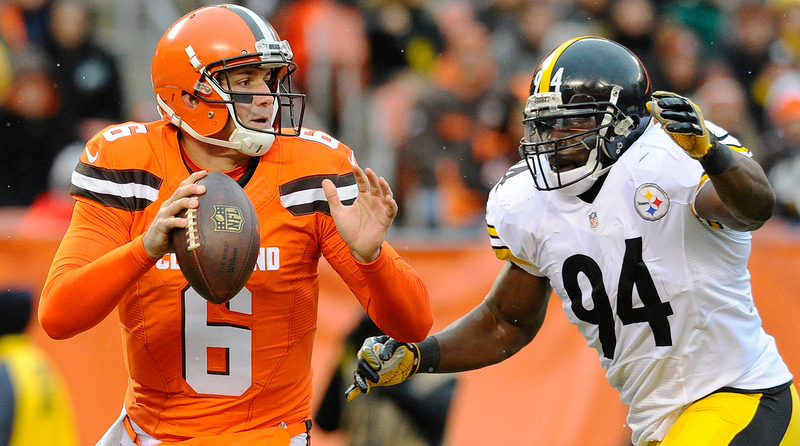 Cleveland is not a quarterback away from success. Why not take another year with Kessler and see if they can get Mahomes or wait until 2018 in a QB-heavy draft? The Browns need stability to succeed. If the front office mortgages the future for a QB who doesn’t pan out, then Hue Jackson, Sashi Brown and Paul DePodesta are out. Those individuals in charge are more important than a QB for the 2017-18 season. My feeling about the Browns and the quarterback is pretty simple: The Browns hired Hue Jackson to turn around the team on the field, and to find and develop a long-term quarterback. If he thinks Jimmy Garoppolo is the long-term answer better than anyone on the roster and better than anyone in the draft, and if he’s convinced that Garoppolo, in the right environment, can win games in January, Cleveland should use its massive draft resources (five picks in the top 65) to go get him. No team in the NFL is going anywhere without a good quarterback. It’s debatable if Garoppolo is good enough, obviously, because we haven’t seen enough of him. But in six quarters, with the Patriots roiling with the Brady suspension last September, Garoppolo beat the Cardinals on the road, and on his first three drives against Miami at home in Week 2, he led the Patriots on 75-, 75- and 86-yard touchdown drives. One NFL head coach with a strong record of quarterback development had Garoppolo with a first-round grade on his 2014 draft board. Quarterback beauty is in the eye of the beholder. I can’t swear Garoppolo will be great; I can’t swear any of these guys are going to be great. But I do know this: If you believe in a quarterback, whoever it is, and have the resources to get him, you’ve got to do it. I love what you did in both the Tom Brady interview and the podcast. The content is exactly the type of thing I want to read/hear; analysis of the game and insights that a fan just can't get in a standard newspaper article. I'm a huge fan of both long-form journalism as well as podcasts and how they both allow for greater depth. They often result in more open, compelling responses from the subject, which happened with Brady. So, yeah, keep doing that stuff. Rick represents many of you who wrote in with similar sentiments; thanks for your comments. In the media business today, we’re looking for ways to increase interest in our product, to find ways to present interesting subjects that are different than the usual sportswriting. Now, the usual sportswriting worked here, I think—I got to tell the story the way I’ve always told it, 7,800 words of interpreting what happened in the Super Bowl comeback, and then on all other things Brady. But the podcast part is what I hope resonated with people. Here, you heard 78 minutes of Brady, unedited. (For those who inquired, there was no mashing together of his voice and cutting out awkward moments. We just ran it the way it happened. I handed Brady a microphone, I had one, we sat on chairs in a grand room in this Montana cabin, and we spoke.) I’m grateful to Brady that he let it happen. This was the second day he was away from it all, and instead of truly being away from it all, he took two hours to make a permanent record with his memory of a great day in his life crystal-clear. It does my heart good that so many people appreciated it. At The MMQB, we’re determined to find different ways to tell compelling stories and deliver content you can appreciate. How is Tony Romo’s contract something teams won't trade for? He will make $14 million next year which is a bargain for a top 15 QB (arguably top 10) and the MVP runner-up in 2014. Ask the Texans if they would rather pay Brock $17 million or Romo $14 million. They are stuck with Brock but maybe they could eat $10 million and give him away as a backup and they would still have the same amount invested in QBs as the team from Washington would pay Cousins. It’s not that easy. No one’s going to trade for Osweiler with the contract he has, and if the Texans cut him, they’d take a $25-million cap hit in 2017; if they keep him, it’s a $19-million cap hit this year. The only way to make it work, if they truly do end up wanting Romo, is to have Romo sign a three- or four-year deal with some guaranteed money and a small salary this year, so the 2017 and ’18 cap numbers would be small. Is it fair to say that the NFL’s decision to not reprimand the Seahawks for failing to report an injury to Richard Sherman, essentially renders the weekly injury report a moot exercise? And was the commissioner asked at his Super Bowl press conference when the league will make public the results of the testing of air pressure in footballs in various games this past season? I can’t get too fired up about the injury report thing with Seattle, though Sherman should have been listed at the very least when he didn’t practice. Sherman didn’t miss any games, and when I asked about it, I was told there was little to no chance he’d ever have missed any time with the problem he had. Regarding the air pressure: Goodell was asked about it extensively 12 months ago. He said then he wouldn’t disclose it. I don’t think he was asked about it this year at the Super Bowl, but I don’t know why he would have been. If he didn’t answer last year, why would he answer it this year? Love MMQB. But please leave the politics out. Would like a few quiet moments with just sports as an outlet. I get emails like this every week, from both sides of the political aisle, and appreciate the sentiments. It’s good to hear from those who support my six or eight sentences/adjectives/other words in what’s usually a column of 6,000 to 9,000 words about what’s going on in the country. I won’t do this in news stories, or very rarely in the lead to my columns. But for 20 years I’ve been giving my opinion on football things and life things, and that’s the column. Overall, it’s 90 percent football, sometimes 98. It’s pretty easy to go to the next sentence if you don’t want to read about whatever I think about what’s going on in the world.